. EDIMAX 5 Port 10/100 Fast Ethernet with 4x PoE+ ports and DIP Switch. EDIMAX 5 Port 10/100 Fast Ethernet with 4x PoE+ ports and DIP Switch. EDIMAX 5 Port 10/100 Fast Ethernet with 4x PoE+ ports and DIP Switch. PoE delivery up to 200m. Power Budget: 71.5W. Auto Energy Saving Functions. Plug and Play. VLAN and Loop Protection. The Edimax ES-5104PH V2 is a five port Fast Ethernet switch with four PoE+ Ports designed for use in home, small or medium-sized network environments. With four DIP switches, PoE ports can be manually set with on/off control, extending PoE delivery distance up to 200m and port-based on/off control for VLAN and QoS is also supported. 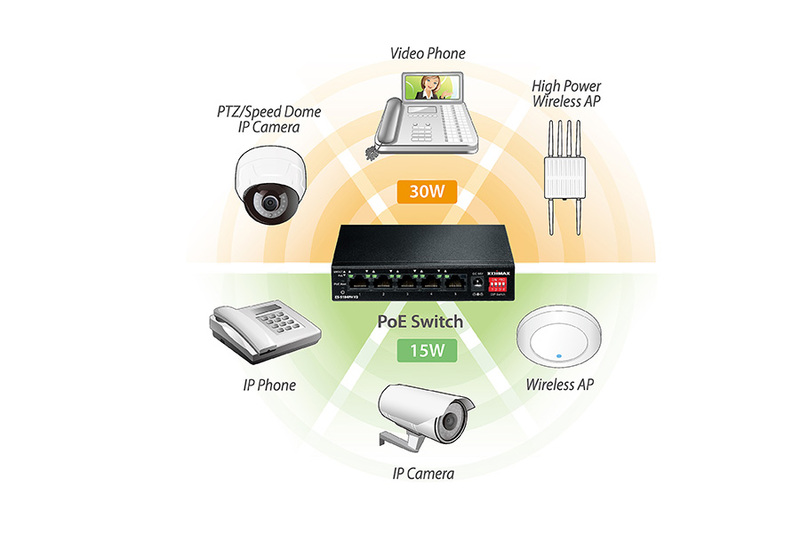 The switch easily connects and supplies power to PoE-enabled devices such as wireless access points, network cameras and IP phones as well as other Ethernet-enabled devices such as computers, printers or network attached storage (NAS). The compact size and fan-less design make the switch an ideal solution for expanding home and small business networks. 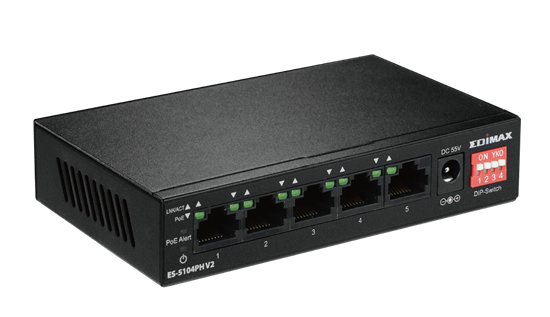 Features four IEEE 802.3at Power over Ethernet (PoE+) ports which supply up to 30W of electricity per port. It can convert standard 100V-240V AC power into low-voltage 50V-57V DC electricity to power IEEE 802.3at compliant network accessories via existing LAN cables. With PoE detection capability, the ES-5104PH V2 is able to verify whether the connected device is IEEE 802.3at compliant. In the event that a PoE device is not detected, only network data will be transmitted through the LAN cable – meaning easy setup and management of network devices such as access points and network cameras. Supports 802.1p QoS via DIP switch port 4. This ensures first priority for video and voice traffic.